Colin started playing with local brass bands in his hometown of Adelaide, (South Australia) aged 5. He began on the tenor horn before moving to the soprano cornet four years later. At age 12 he took up trumpet while studying at Marryatville High School, as part of the schools’ “Special Interest Music Program”. While at Marryatville, Colin received his first exposure to the delights of the orchestra, eventually holding the position of 1st trumpet in the Senior Orchestra and Concert Band for the last three years of high school. During this time he was featured as “guest soloist” with the South Australian Police Band at their annual ‘Proms’ concert, playing the 2nd and 3rd movements of Haydn’s Trumpet Concerto. In 1997 Colin moved to Victoria to further his musical studies at the Victorian College of the Arts in Melbourne, also playing for the Hawthorn City Band. A move to New Zealand followed in 2001 when he signed to play for Dalewool Auckland Brass on Soprano, and later that year joined the Royal New Zealand Navy Band for the first time. In 2005 he moved to Christchurch, joining the New Zealand Army Band and the prestigious Woolston Brass. He returned to Auckland and the Navy Band after the birth of his daughter Isabella in 2008. 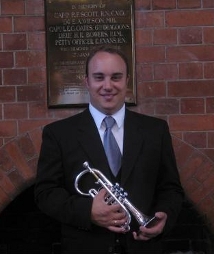 Four times Australian Junior Brass Champion of Champions, and winner of numerous state and national solo championships on both sides of the Tasman, Colin has represented both Australia and New Zealand in National Brass Bands, the RNZ Navy and NZ Army Bands both at home and overseas. More recently Colin has taken up the baton, firstly as Resident Conductor at Dalewool Auckland Brass, and in May 2011 he was appointed as the Conductor of North Shore Brass, guiding the band to success at the Auckland Regional Championships.